Stunning villa with a total of 6 bedrooms, 6 bathrooms (plus WC), 3 living areas, a private cinema and a huge 4.5m x 14.5m private pool. Very well presented throughout. Air conditioning in all bedrooms and main living areas. Wonderful open views that include the sea from parts of the terrace. Lovely outdoor kitchen / bbq / dining area. Wifi & UK satellite television channels. Highly recommended. A spacious well-furnished and fully equipped villa with larger than average private pool and excellent views. Ideal for large groups or families wishing to holiday together. All bedrooms are en-suite and air conditioned. Billiard table, cinema room, basic gym and excellent range style gas BBQ! Entry to the property is via electronic gates with a separate pedestrian entrance and private parking for several cars. The front door through a stone arched entry vestibule leads into a spacious hallway. From the left of the hallway are two bedrooms one double and one twin both with en-suite bathrooms and air conditioning. To the right of the hallway is a spacious fully fitted kitchen with a range of eye and base level units, eye level oven, integrated microwave, hob, granite work tops, fridge/freezer and dishwasher. The extremely spacious lounge/dining room has elegant cream leather sofas, crystal chandeliers and modern dining set. It has a large LCD television with U.K. channels and air conditioning. From the dining area you can access the pool and large covered naya (open sided conservatory) with ample comfortable seating which leads to the impressive summer kitchen complete with a range of units, granite worktops and built in range style gas BBQ. The larger than average 12 meter by 4 meter private pool has Roman style steps, a dolphin feature in the tiles and is surrounded by large terraces with ample sun loungers and patio dining furniture. There is a pool-side shower and ornamental fountain with excellent views from the pool terraces. The washing machine is housed in a separate utility room. From the main entrance hallway stairs lead down lead to a second large lounge area with Sofas and an American style kitchen. There is also a billiard table room. 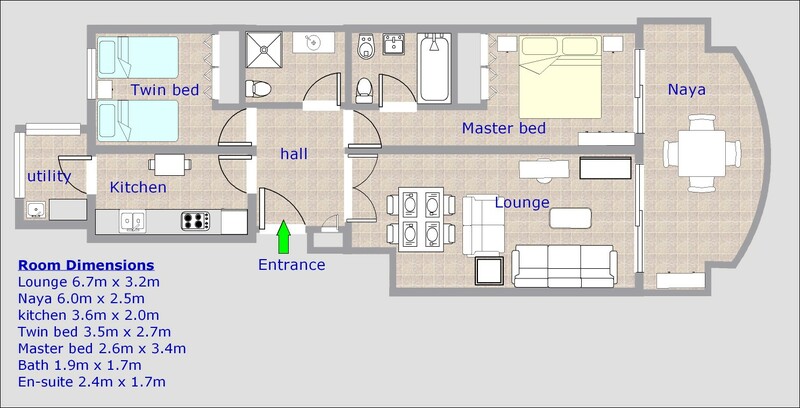 On this level are three further bedrooms, two twins and one double, all with en-suite bathrooms and air conditioning. There is a small a gym with basic fitness equipment and a cinema room. A door from the stair well leads to a big garage housing another washing machine and a large freezer. From the main entrance hallway stairs lead up to the master suite. This consists of a large bedroom with double bed, en–suite bathroom and air conditioning, a private lounge, kitchen area and French doors leading to a terrace overlooking the pool and stunning views. The villa is surrounded by well-kept gardens and stands on a secure gated and enclosed plot. Casa Rio has been designed and furnished to provide a high level of quality and comfort for the large group and has spacious and flexible accommodation giving some sense of independence and privacy where required. Highly recommended. Please note: There is low lying, minimal noise construction works being carried out nearby. 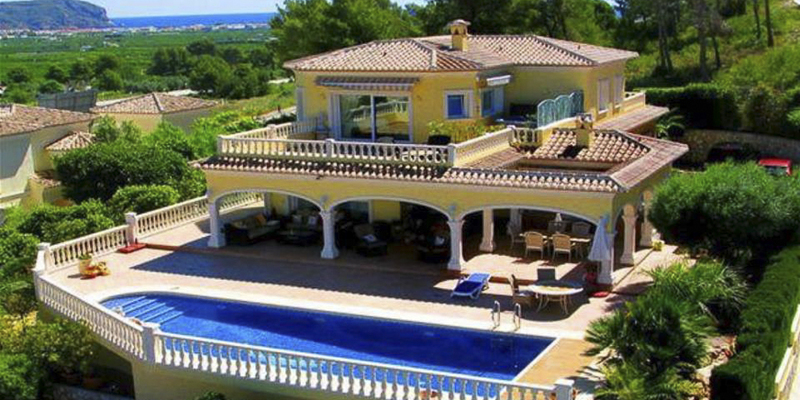 The prices for this fantastic villa have been set to compensate for this. Siete Olivos holiday villa in Javea with 4 spacious bedrooms including 1 lovely master suite - and 2 modern bathrooms. Sleeps up to 10 people. 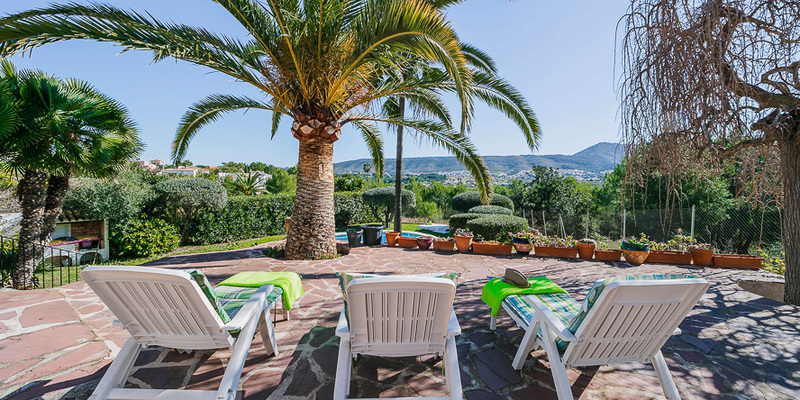 Offers air conditioning in all bedrooms (from June 1st 2019), wifi, television, private garden and swimming pool with hillside views. This villa has been recently renovated to a nice modern standard. Externally you will find a gravel driveway which is gated, with space for up to 4 cars. On entering the villa via a covered porch you will find to the left of the hallway (complete with piano for budding musicians), three bedrooms and one shower room. There are two double bedrooms, both with built in wardrobes and mosquito nets on the windows. The third bedroom in this part of the house has bunk beds that sleep 3, and there is also a fold up bed available. Also with mosquito nets. The shower room / wet room is large and fully tiled with a walk in shower and towel rail. Carrying on from the hallway you enter the bright lounge area which has a log burner for winter rentals, a ceiling fan, comfortable seating and a flat screen TV with Spanish and UK Freeview TV channels. There are wide patio doors onto a covered naya area. To the right of the lounge is the dining area with table and seating, and off this is the spacious kitchen. To the back of the kitchen is an enclosed utility area with washing machine and a second fridge / freezer - perfect for those cold drinks. To the left of the lounge you enter another hallway which is the lovely master suite - here you will find a full bathroom with a lovely crisp white modern bath and separate shower cubicle. The bedroom itself has a kingsize bed and two built in wardrobes. There is a television in this room (UK and Spanish channels) and air conditioning. The master bedroom has a balcony which overlooks the garden and pool, and there are also double doors leading onto the covered naya. The covered naya has a couple of sofas for relaxation, a further dining table and chairs, and there is a BBQ available here. Steps down into the grassed area with 10m x 5m slight kidney shaped pool (2m deep at the deep end). The pool is surrounded by Olive trees. The garden and pool area is not overlooked so you can eat and bathe in privacy. Wifi throughout. Also a selction of DVDs and board games are available for your entertainment. For winter rentals, there is central heating throughout this villa, and a log burner in the lounge. Security: all windows and doors are fitted with rejas. Before entering the villa you will find a chill out area with rustic furniture, hanging lighting and a television. A perfect area to escape from the summer heat or enjoy a few games. On entering the villa on the ground floor through the hall you will find a cloakroom. The hall leads through to the open plan lounge, dining room and kitchen. The kitchen is fully equipped to include a dishwasher and Dolce Gusto coffee machine. In the lounge you can get Spanish, German and by Summer 2019 also UK television. Keep going and you arrive at a further sitting room, a perfect area for enjoying a drink overlooking the spectacular view of the Mediterranean. There is an air conditioning unit which serves this floor. There is a spiral staircase leading to the lower ground floor where you will find two bedrooms, 1 bathroom, a walk in wardrobe and a spacious utility area. Bedroom 1 is very spacious with a double bed, built in wardrobes, air conditioning and a television. Bedroom 2 also has a double bed with built in wardrobes and air conditioning. The bathroom has a large shower, a modern sink unit, towel radiator and external window. Going through to the utility area you will find a walk in wardrobe with even more hanging space and shelving providing plenty of storage for clothes, luggage and pool toys and so on. The utility area has 2 washing machines and 1 tumble dryer. A fold up bed, sofa bed and a cot are all available, please ask when booking if you require bedding for these, at no extra charge. Outside is the south facing terrace furnished with sunbeds, dining furniture and a barbeque and sink area. The terrace offers marvellous panoramic views over the sea and pool area. On a sunny day you can see Ibiza on the horizon. The kidney shaped swimming pool is 4 x 8 meters and there is an outdoor shower. The deep end of the pool is approximately 2 meters deep. 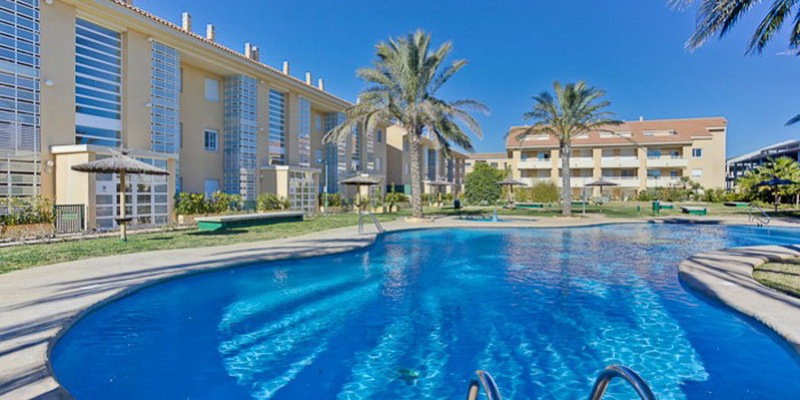 With the nearest beach located 2.5km and the coastal resorts of Javea and Moraira at approx 9km and 8km respectively Vista Del Mar makes for a perfect holiday location. There is a local supermarket located on Cumbre del Sol which is just a few minutes drive away from the property. This villa has heating so is ideal for winter holiday lets. There is a covered parking space and plenty of off road parking. Please note our other property "Casa Del Mar" is next door so these two villas are ideal for larger groups who wish to holiday together.